Literal Strings consists of any number of characters between opening and closing parenthesis. Each pair of hexadecimal defines one byte of string. A names object is uniquely defined by sequence of characters. Slash character(/) defined a name. /Sec#20Savvy mean Sec Savvy 20 is hexadecimal value for white space. An array object is collection of objects. 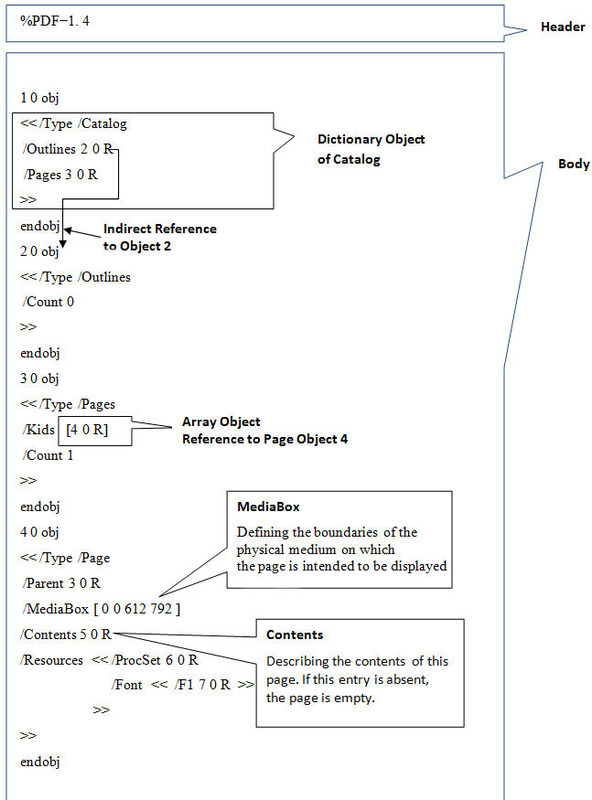 PDF array object can be heterogeneous. It is defined with square brackets. Dictionary object consists of pairs of objects. The first element is key and the second is value. The key must be name. A dictionary is written as a sequence of key-value pairs enclosed in double angle brackets (<< … >>). Count is a key and 1 is value. A stream object, like a string object, is a sequence of bytes. Stream can be of unlimited length, whereas a string is subject to an implementation limit. For this reason, objects with potentially large amounts of data, such as images and page descriptions, are represented as streams. Objects may be labeled so that they can be referred to by other objects. A labeled object is called an indirect object. obj and endobj is a keyword. This object defined a string of object number 10. A filter is an optional part of the specification of a stream, indicating how the data in the stream must be decoded before it is used. For example, if a stream has an ASCIIHexDecode filter, an application reading the data in that stream will transform the ASCII hexadecimal-encoded data in the stream into binary data. 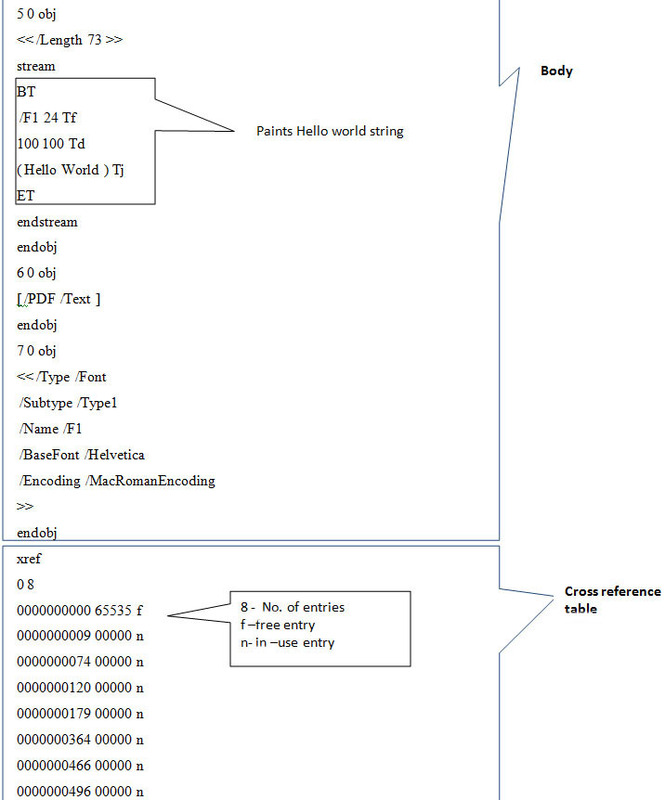 The cross-reference table contains information that permits random access to indirect objects within the file so that the entire file need not be read to locate any particular object. The table contains a one-line entry for each indirect object, specifying the location of that object within the body of the file. 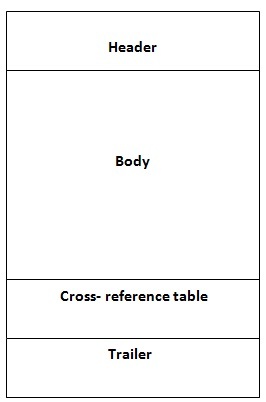 Each cross-reference section begins with a line containing the keyword xref. Following this line are one or more cross-reference subsections, which may appear in any order. introduces a subsection containing five objects numbered consecutively from 0 to 8. 0000000009 is 10 digit byte offset in the case of in-use entry , giving the number of bytes from the beginning of the file to the beginning of the object.